This is a Sidewall. It was distributed by Nancy McClelland. It is dated 1928 and we acquired it in 1998. Its medium is block printed on joined sheets. It is a part of the Wallcoverings department. The Colonial revival movement in the early years of the twentieth century prompted a number of wallpaper manufacturers to start reproducing antique patterns. Nancy McClelland raised the bar when it came to reproduction wallpapers. She had her reproduction wallpapers woodblock printed in France in the same manner as the original. 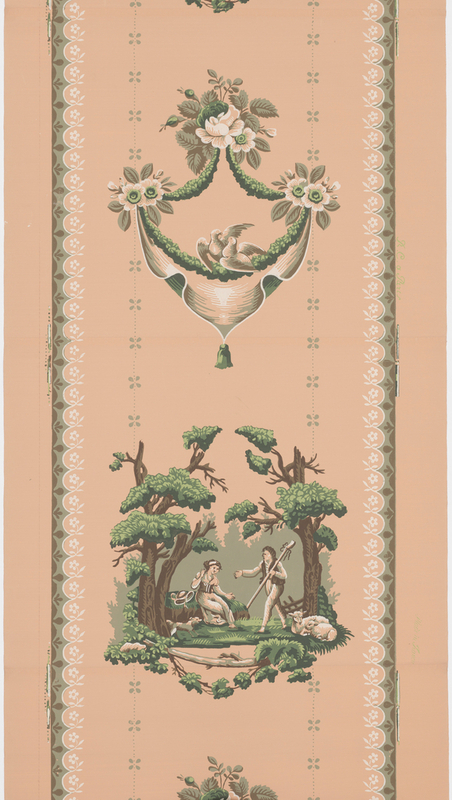 On this wallpaper she even printed the design on joined sheets of paper, the original way to make a roll prior to machine-made continuous paper which began in the 1820s.